I saw yet another video today showing a family with young children using essential oils. 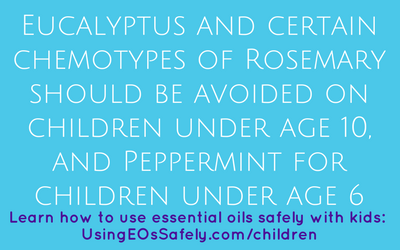 Unfortunately, using essential oils around young children is not all sunshine and roses. 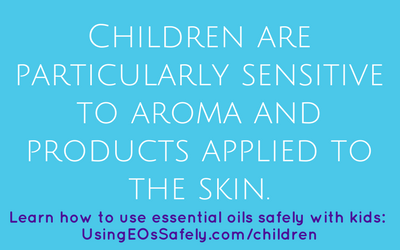 Due to the high concentration of essential oils, there can be serious adverse consequences to using essential oils without diluting.Children are particularly sensitive to aroma and products applied to the skin. A child’s immune system takes years to fully develop, making them less able to deal with the adverse effects which may arise when concentrated products are placed on the skin without dilution. 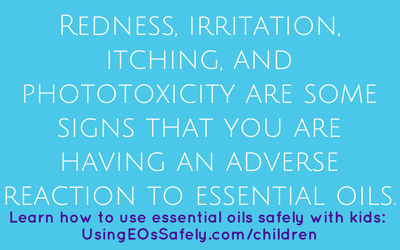 Essential oils are never recommended for use without first diluting, especially when using them on children. You can find dilution guidelines here: Properly Diluting Essential Oils. 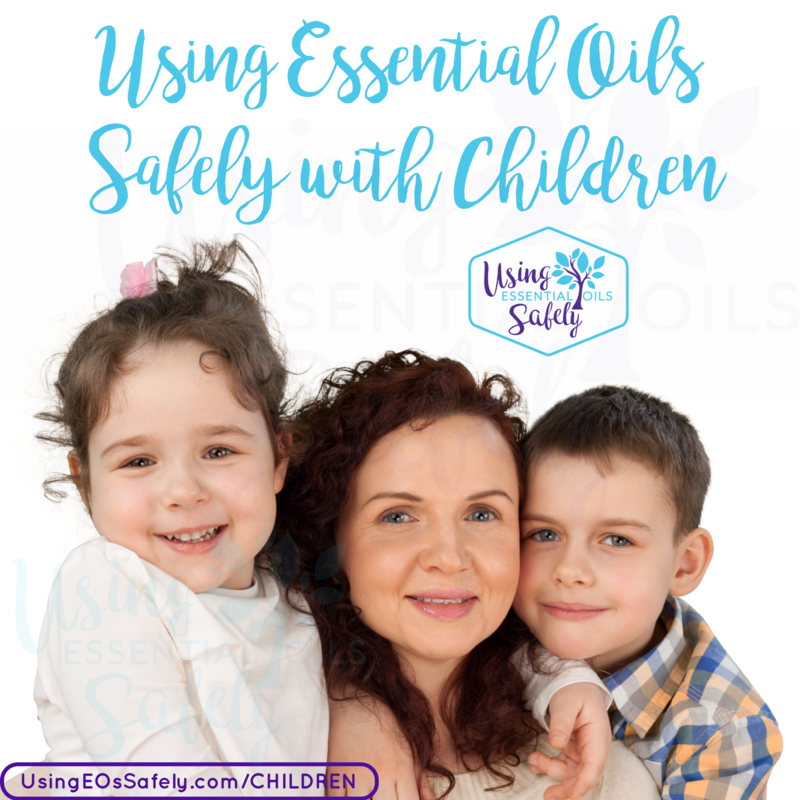 Although it’s generally recommended to avoid using essential oils with young children, even older children can react negatively to some essential oils when inhaled. An alternative to Eucalyptus and Peppermint: Anti-Congest Essential Oils family safe blend recipe. Some adverse events can be seen right away. Redness, irritation, itching, and phototoxicity (read more here) are some signs that you are having an adverse reaction to essential oils. If you’re thinking that because you use “therapeutic grade” essential oils that your children are somehow protected, you will want to read my post Name Games. 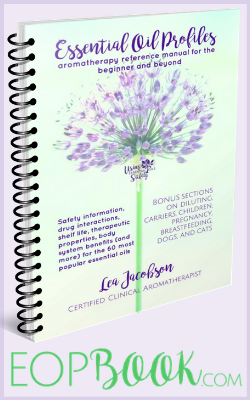 In this article you will learn that all essential oils, by definition, are therapeutic grade, and there is no official certification – only self-certification. Essential oils should be used with caution and intent. It is not recommended that essential oils be used (topically, or inhaled) with babies before the age of six months due to their thinner skin and immature immune systems. After the age of six months, you may diffuse child safe essential oils for a specific purpose and short periods of time. For an acute case (like a bee sting or bug bite), you may use essential oils topically, but this should be the exception and not the norm. Children are particularly sensitive to aroma and products applied to the skin. After the age of 2 years you may start topical use with a very low dilution (less than 1%), but keep in mind a child's immune system takes several years to fully develop, making them less able to deal with the adverse affects which may arise when concentrated products are used improperly on or around them. Herbs and hydrosols (like for baby wipes) are often a better and safer choice for children. After the age of 6 years the immune system has likely matured, and adverse reactions from low dilutions of essential oils are not as likely. You'll still want to use low dilutions (usually 1%), but thicker skin is going to provide more protection from topical applications. 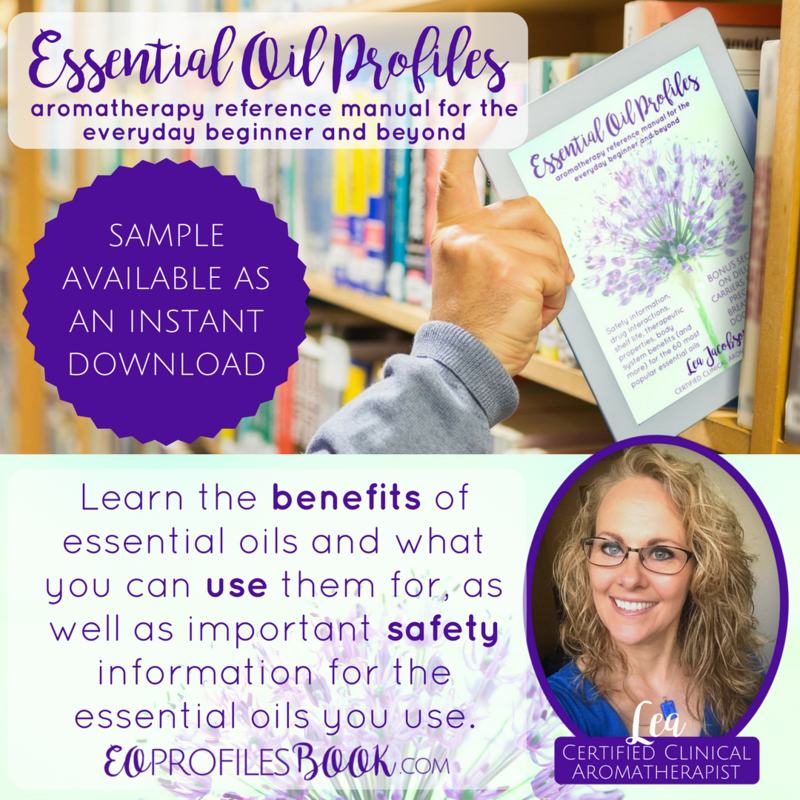 You can find profiles with details for most of the above essential oils on our app, ebook, or print book on our resources website here. 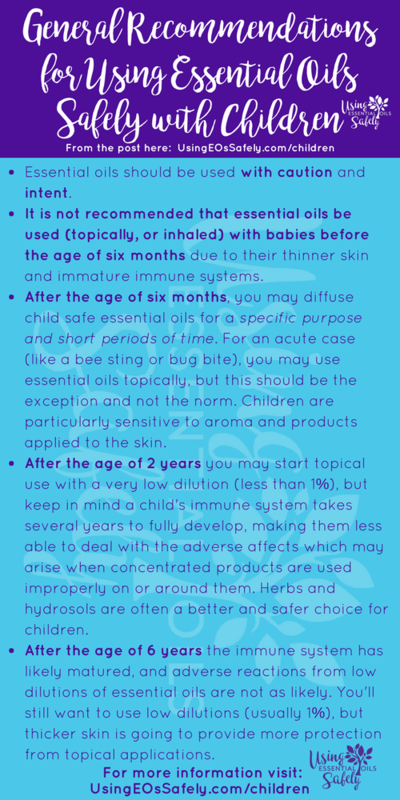 There are essential oils which should be avoided with children – either just inhaling, just topically, or both (referred to below as “all routes”) – due to various reasons noted below (source: Essential Oil Safety). 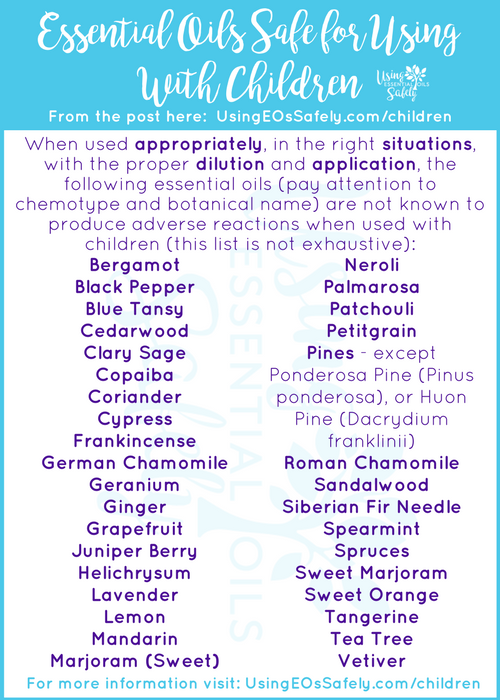 Some essential oils have several different species or chemotypes – some are safe for children, and some are not. Please take note of the species or chemotype noted to lessen confusion with other essential oils with the same name. NOTE: if it says “avoid using (all routes)” that means everything – do not use topically or allow them to inhale. It goes without saying children should also not be exposed to the essential oils on the list here: Essential Oils Never to Buy. This applies to all brands of essential oils, even “therapeutic grade” or essential oils that are “GRAS” or “safe for ingestion.” Read more: Name Games. You can find profiles for some of the above on our app, ebook, or print book on our resources website here. If you want to inhale essential oils not safe for kids, instead of diffusing in a main area your children are in, the best solution is to use a personal inhaler. 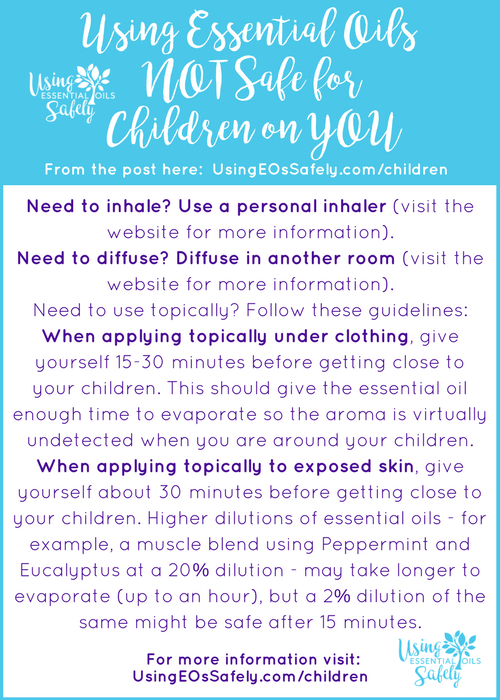 If you do decide to diffuse essential oils not safe for children, be sure it is in a room your children are not currently in. After diffusing, give the room an hour to air out before letting kids in. To accelerate the process, you can open a window for about 15 minutes before letting your children back in the room (the objective is to eliminate all aroma of the essential oil). Using a fan along with a window might eliminate the aroma in only 5-10 minutes. When applying topically under clothing, give yourself 15-30 minutes before getting close to your children. This should give the essential oil enough time to evaporate so the aroma is virtually undetected when you are around your children. When applying topically to exposed skin, give yourself about 30 minutes before getting close to your children. Higher dilutions of essential oils – for example, a muscle blend using Peppermint and Eucalyptus at a 20% dilution – may take longer to evaporate (up to an hour), but a 2% dilution of the same might be safe after 15 minutes. Yes, you can clean with essential oils not safe for kids. Just be sure they are in a different room when you are spritzing your counter or wiping things down – then give the essential oils a few minutes to evaporate before your kids return to the room. 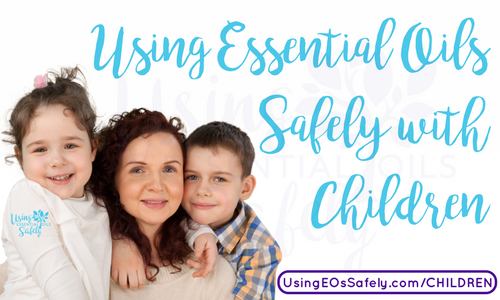 If your kids are near you, in the same room, or helping you clean, be sure to use essential oils safe for children to be around. Please do your own research before using essential oils as presented by marketers who have a business to sell products. Our children rely on us to look out for their best interest. Lets not let them down.